London - Manchester City's potential run of 15 games to a historic achievement of winning a quadruple gets off to a gentle start at Championship-bound Fulham on Saturday. City's outstanding defender this season Aymeric Laporte continues to be ignored by France boss Didier Deschamps. Meanwhile, Kevin de Bruyne, Vincent Kompany, Nicolas Otamendi, John Stones, Fabian Delph and Benjamin Mendy were given more time to recover from injuries. 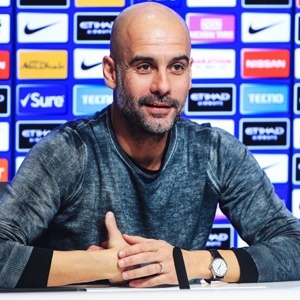 "They have to go to their national teams, they have to go, enjoy and play for their country, but I hope they can come back fit like they are now," Guardiola said as City signed off for the international break by coming from 2-0 down to beat Swansea 3-2 in the FA Cup quarter-finals. "Maybe they will go away, score three goals and return with the same rhythm, who knows? I just want them fit and here." Guardiola got his way in more ways than one. Key players like Ilkay Gundogan, Leroy Sane and Bernardo Silva have returned unscathed. Meanwhile, Raheem Sterling's sensational club form has finally carried onto the international stage as he scored four times in England's thrashings of the Czech Republic and Montenegro. "He's in a really confident moment, not only on the field, but off the field he's so mature and comfortable in himself," said England manager Gareth Southgate. Guardiola deserves his share of the credit for the blossoming of Sterling's potential since the stinging criticism that came his way after England's embarrassing Euro 2016 exit to Iceland. "We can't hide from the fact that he's had difficult moments with England and he's turned that full circle," added Southgate. Guardiola took charge of City that same summer and has helped harness Sterling's potential into a world class talent. Fulham face a very different fight in the coming weeks as they need a great escape to avoid relegation after just one season back in the top flight. Scott Parker's men are 13 points adrift of safety and the former Chelsea midfielder is under no illusions to the scale of the task facing his side this weekend. "I think we all understand the challenge ahead; they are fantastic players and a fantastic team, along with a manager who's arguably going to go down as one of the greatest," Parker told reporters on Thursday. "We can put all of the scenarios in place and understand how they're set up, but you're still up against it because they're that good."